Clusters of small, sweetly scented, pale pink flowers open from purple-pink buds in January among lustrous, lance-shaped, dark green leaves with yellow margins. The flowers are followed by spherical, red fruit. 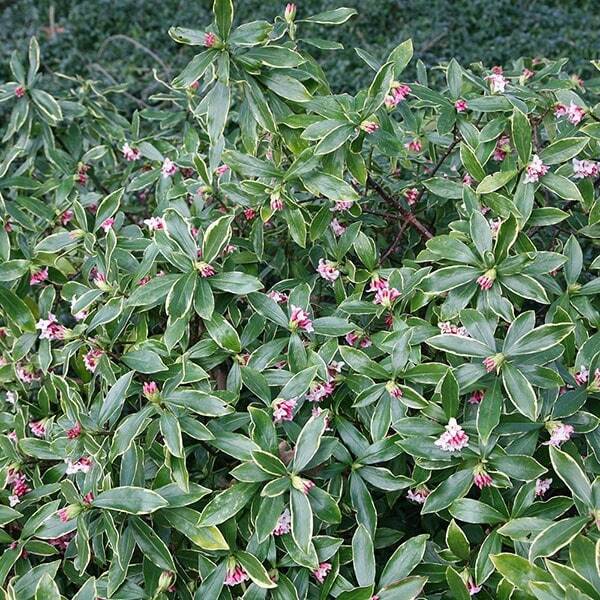 This evergreen shrub thrives in a sunny, sheltered position where its handsome, variegated foliage will brighten the winter garden. Try it at the edge of a mixed border or next to a path where its intoxicating fragrance can be appreciated. yes i I had a bigger garden! We bought this Daphne a few years ago. It is in bud now, the flowers have a very delicate perfume. The leaves are variegated so the shrub always looks good. I also bought my sister one for her new garden as a gift. A super plant, quite slow growing and not yet in flower . Just what the garden needs in late winter/spring. Use close to a path in regular use. A really handy tough survivor. I bought two daphne and both are flowering and doing well. I'd like to add how much I like the crocus website, especially tips on plant combinations. It was planted in 2014 and I have never had a flier on any part of the plant! 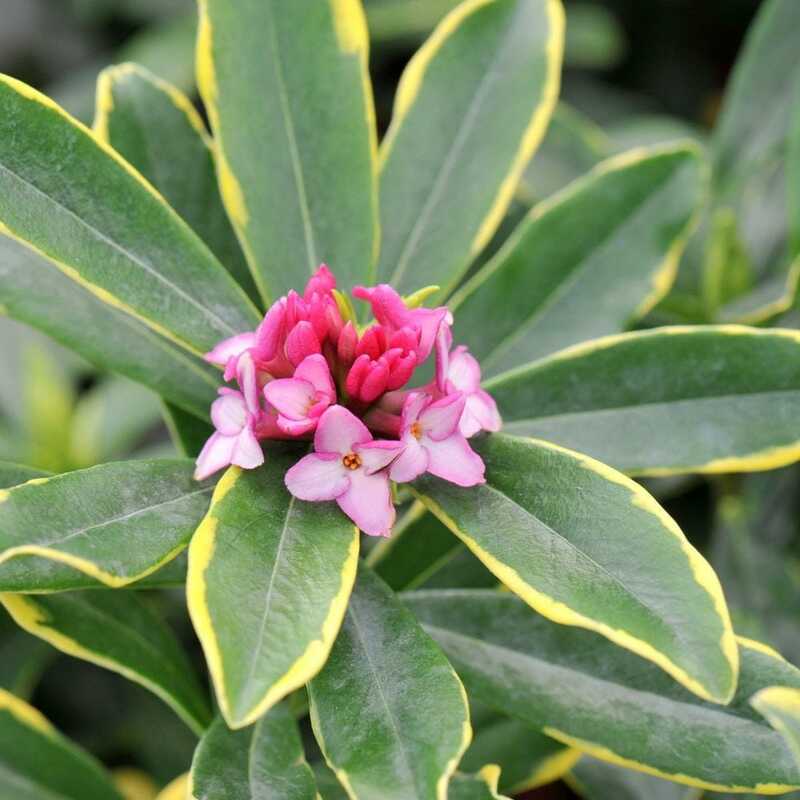 I recently bought a Daphne Odora Aureamarginata from you which duly arrived in very good condition and has been doing very well since I planted it.. However when I came back from two weeks holiday, although planted in a large container and watered regularly, the leaves were drooping quite badly and was obviously suffering from a lack of water. I have given it a good soaking but it has failed to respond. Do you think I may have lost it? Hello, I'm sorry to hear that your daphne has suffered a setback, but it's really difficult to know if it will bounce back or not, as it really depends on how severe the damage is. The best thing you can do now then is to water it thoroughly, making sure the excess water can drain away freely, then repeat the process again when the compost feels quite dry - and wait and see what happens. Hello, It's really hard to say as it will depend on how much damage has been done, and the only thing you can do I'm afraid is wait and see what happens. For now though water it thoroughly, making sure the excess water can drain away freely, and then only repeat this process when the compost feels quite dry to the touch. I have a two year old daphne odora aureomarginata in a large pot positioned by my front door to appreciate the fragrance. It gets the morning sun but is sheltered from the hottest sun and strong winds. It is growing quite strongly with more than 20 flower clusters many of which are open but there is no discernible scent. When I bought it with one tiny flower cluster there was a strong perfume. What has gone wrong? Hello, I don't think you have done anything wrong, but scent can be elusive, as it is usually stronger in sun - and on a calm day. Hi I bought this plant from you a while ago and initially put it in a container where it didn't seem too happy so I transferred it to a border in semi shade near a path. Initially it seemed happy but has since lost quite a lot of lower leaves. There are plenty of new growth on all stems. Is it just adjusting to its new home and reacting to being moved and should I feed it? Hello there You were right to move it to a border as Daphnes often don't grow well in pots. As you say it could be that it is still settling in to it's new home, so as long as it has new growth I wouldn't be too concerned, and evergreen plants will naturally drop some leaves. Make sure that it has a moist, but well drained humus rich soil, - they hate to be waterlogged, and remember this is not a fully hardy plant so it may need winter protection. I wouldn't feed it now but in the spring give it a mulch with a well rotted compost or manure. I'm wanting to buy this as a housewarming present for a friend who's just moved and now has a small front garden. But her garden (Brighton, south coast) is north facing. 1. How essential is full sun for this to flower sufficiently for the sweet scent to be enjoyed in Spring? Growth rate/size of spread matters less. 2. 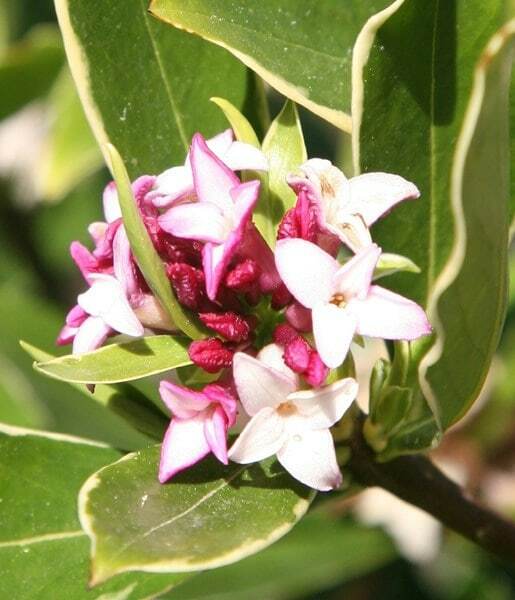 Is the new Daphne Eternal Fragrance, which flowers for much longer, also scented, and would that cope without direct sun - or in part-sun, which I have in my own garden? Thanks. Hello there Daphne odora 'Aureomarginata' will tolerate partial shade as long as it gets some sun, but we don't recommend daphnes for a north facing aspect. This particular daphne is borderline hardy so needs a sunny sheltered warm spot. Unfortunately I wouldn't recommend this plant for your friend's north facing garden. Yes Daphne × transatlantica 'Eternal Fragrance' is fully hardy and will tolerate some light shade, but will again need some sun during the day. Hello, could you please tell me when is the best time of year to transplant this plant? It was initially planted last spring so it is still quite small. I would like to do it this autumn but am not sure if I should wait until the spring. Many thanks. Hello there Established Daphnes don't normally like to be moved, but as this was planted in the spring and won't be fully established yet you could try and move it now in October, or in the spring once the soil has warmed up. However I would make sure that wherever you move it to, this it's final home. Is this plant toxic to rabbits? Hello, I am not an expert on rabbits, but I have done a search on the internet for plants that are poisonous to rabbits and found the following... http://www.rabbitawarenessweek.co.uk/environment/plants-that-can-be-harmful-to-rabbits/ ...and as you can see Daphnes are on the list! I am trying to choose between the odora and the aureomarginata varieties. Please could you tell me which has the stronger or most pleasant fragrance. Hello there Both the Daphne odora and Daphne odora 'Aureomarginata' have the same scent, the only difference is that 'Aureomarginata' has a yellow margin on the leaf, so maybe it will be which leaf you prefer. Can this plant be grown in a pot? If it can what size do you recommend.